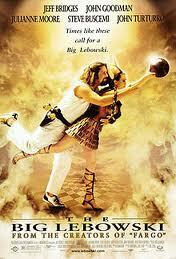 The Big Lebowski – Did You See That One? Ethan and Joel Coen are behind a lot of great movies. Their credits include films like Fargo, No Country for Old Men, and True Grit. This movie is written and directed by the pair, and like many of their movies, it has an all-star cast. This movie features Jeff Bridges, John Goodman, Julianne Moore, Steve Buscemi, and Philip Seymour Hoffman. If that list doesn’t impress you, let me add onto it with Tara Reid, Flea, John Turturro, and David Huddleston. This great cast is only a part of what makes this a movie worth watching time and time again. 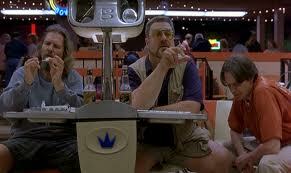 How does a slacker bowler (Bridges) get compensated for a ruined rug? He goes to the millionaire he was mistaken for (Huddleston) and demands to be paid. Soon he’s mixed up in a wild and dangerous adventure with his bowling buddies (Buscemi & Goodman), and all the while he’s still looking for someone to pay for his rug. I don’t want to take the time to butcher the plot of this movie, it’s far too intelligent to boil down into a paragraph. It’s the rich man’s Napoleon Dynamite. Let me just leave you with these tasty morsels…. Saddam Hussein working in a bowling alley. The weirdest bowling team rivalry ever. The rumble in the parking lot. This movie has everything, great dialogue, great acting, and a ridiculous story that just works. 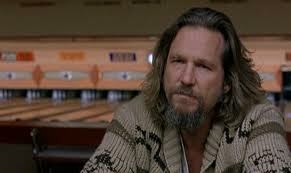 The work of Jeff Bridges really anchors this movie. He does such a good job of sinking into the role that I’m sure they wrote his part with him in mind. Goodman is a great opposite to Bridges in this movie as well. 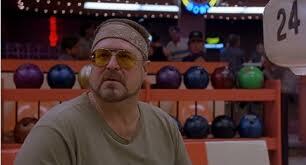 For every laid back moment for The Dude, you’re treated to an over-the-top reaction from Walter. Mix in some ill-timed comments from Donny (Buscemi) and you have a lot of movie gold. It’s something that’s almost impossible to put into words. How can you make a movie that doesn’t make sense and leave people understanding it all the same. I guess that’s what makes people like the Coen brothers so good. I’m sure that some people will disagree, but I give this one 4.9 out of 5 stars. I’ve been trying to see this one for a while. I’m always embarrassed to say I haven’t seen it, despite the fact I’m a big Coen brothers fan. Nice review. Thanks! This is a great movie, so find the time! It’s such a smartly written screenplay. They just had to find the right guy, Bridges was definitely right for that role. Pingback: Monsters University | Did You See That One? Pingback: Birth | Did You See That One? Pingback: True Grit (2010) | Did You See That One? Pingback: Bad Company | Did You See That One? Pingback: The Fisher King | Did You See That One? Pingback: 22 Jump Street | Did You See That One? Pingback: Hell or High Water | Did You See That One?